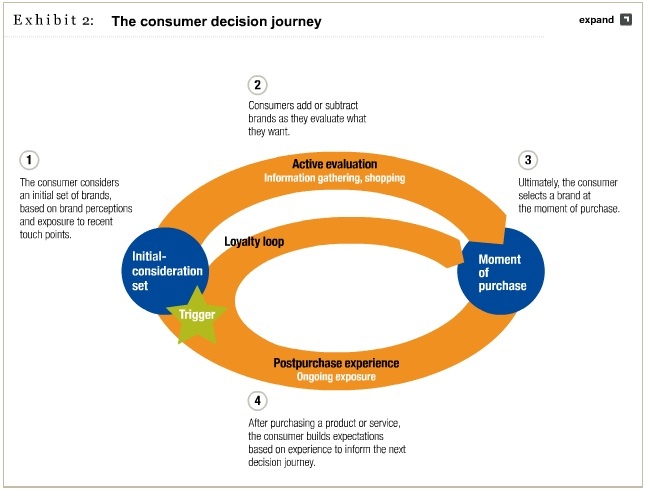 consumer decision journey | Brand-o-Matic! 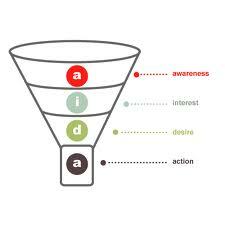 McKinsey recently published the analysis of a terrific piece of research, in which they detailed the route of what they called the “consumer decision journey.” Those of us who grew up with the AIDA model of consumer behavior (Awareness, Interest, Decision, Action) and all the various funnel models (awareness set> familiarity set >consideration set > purchase) have known for some time how flawed these models were as reflections of real life decision making, especially since the advent of the Internet turned decision making on its head. The new map McKinsey charts begins with an initial consideration set of brands the consumer is already aware of. But rather than getting winnowed down, the set grows considerably as the consumer actively evaluates not just the initial consideration set, but anything else they find through word-of-mouth, web searching or newfound attention to advertising. In other words, whereas once we thought of consumers as gatherers of information (which we supplied), they are now hunters of information. Eventually they make a decision — very often at the point of sale. But more often than not — up to three times more often — that decision is in favor of a brand within their original consideration set. So what does that mean for brand marketers? You shouldn’t ignore “push” advertising. If you can find ways to gain awareness of your brand and make it part of the initial consideration set, you stand a much better chance of being chosen. That means traditional media advertising still has validity. But inasmuch as traditional media advertising is no longer the only way to gain attention, you have other options, too. The idea of inbound marketing — capturing idle interest through dissemination of interesting information can certainly be effective. You need to make as much information about your brand as available as you possibly can. Many marketers have assumed that if they pushed hard enough to ingrain their brand in the minds of consumers, they didn’t have to work so hard educating them on the back end. Not so. When the gatherer goes out hunting for information, you’d better be there. Moreover, if your brand isn’t already part of the consumer’s initial consideration set, the evaluation process gives you another chance to find your way into her heart. It’s not enough to publish manuals on your web site; you need to be out there with testimonials, customer forums, category information and wisdom,… you name it. Pay attention to point of sale. All the evaluation consumers do can actually be confusing. Decision making is often left to the point of sale. It’s where the battle is often won. Oh, and one more thing they found: consumers aren’t blindly loyal to the brand they chose (as if we didn’t know that). Because they tend to have evaluated the brand’s claims more carefully in the decision making process, they can be tougher in their post purchase evaluation. Does your brand live up to its promises?